Will this burgeoning green business turn to bust? “THIS is qat,” explains Teklu Kaimo, gesturing to the wooded field behind him. He started growing it in 1976, and over the years its soft, green leaves have brought him a measure of prosperity. He has a modest plot of land, 11 children and money to pay their way through school. A short walk down the hill, the central marketplace of this part of southern Ethiopia comes alive with farmers, merchants and salesmen as the sun sets. Young men sprint down streets with bundles of fresh qat leaves on their shoulders, as traders call out prices and haul the bags aboard lorries. They are bound for Addis Ababa, the capital, where the following morning they will be sold to qat-chewers in the city, or packed onto planes bound for neighbouring Djibouti and Somaliland. Ethiopia’s trade in qat, a mild stimulant native to this part of Africa, is booming. Where once cultivation and consumption were restricted to the Muslim lowlands towards the country’s east, today it is grown and masticated throughout the country. Nearly half a million hectares of land are thought to be devoted to it, some two-and-half times more than was grown 15 years ago. Many of those cultivating it have switched from coffee, Ethiopia’s biggest export, to one that offers juicier and more stable returns. Qat is now the country’s second-largest source of foreign currency, and, with prices rising, a handy source of government revenue. The industry’s growth is partly due to increased consumption. 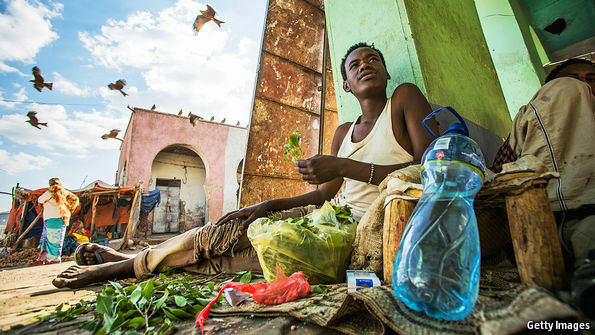 Qat kiosks are dotted around all main towns; young men chewing on street corners or in university libraries have become a ubiquitous feature of Ethiopian life. For many, its spread is a symbol of national decline. “It is getting worse by the day,” says Fitsum Zeab, a businessman in Addis Ababa. Much the same is true in neighbouring Kenya, the region’s second-largest qat producer. Here, too, demand is growing, thanks to a large diaspora of Somalis (the plant’s long-standing international missionaries) and better roads that allow farmers to get perishable qat to market while it is still fresh. And economic importance is translating into political heft: last year Kenya declared it an officially sanctioned cash crop. But the plight of Maua, a small town considered the Kenyan trade’s epicentre, gives pause for thought. Britain’s decision in 2014 to ban the substance (against the advice of its drugs advisory council, which thought it harmless) slammed the qat economy. In 2013, before the prohibition, Britain imported some £15m-worth ($25m) worth of the stuff. Prices have since fallen by half and unemployment has risen sharply. “Everyone is feeling the pinch now,” says Lenana Mbiti, a former trader. That gives pause to Ethiopian farmers too. Although they have been less affected by bans in Europe because they sell most of their crop close to home, they fret that their market will shrink. Experts doubt that qat will ever become a mass-marketed global commodity like coffee, tea or sugar. Instead, small towns in places such as Wondo-Genet are becoming dependent upon the production and trade of a substance that will probably be outlawed in yet more countries. Even so, qat’s popularity among farmers persists because it is perhaps the only crop that can provide sufficient income from a small plot of land to support a family. “There is simply nothing else,” says Birhanu Kiamo, Mr Kaimo’s brother, neighbour and fellow qat farmer.